Calling all pumpkin chuckers, wannabe marauders, and tinkerers of all ages! Flinging things and playing at defending your own castle has never been more fun. Whether playing at defending their own castle or simply chucking pumpkins over a fence, wannabe marauders and tinkerers will become fast acquainted with Ludgar the War Wolf, Ill Neighbor, Cabulus, and the Wild Donkey—ancient artillery devices known commonly as catapults. 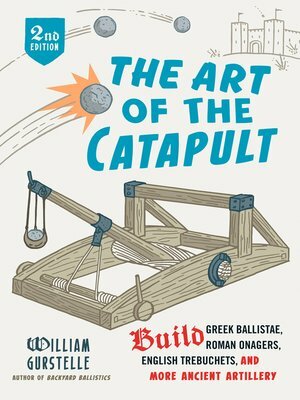 Updated and improved instructions and diagrams illustrate how to build 10 authentic working model catapults, including an early Greek ballista, a Roman onager, and the apex of catapult technology, the English trebuchet. Additional projects include learning how to lash and make rope and how to construct and use a hand sling and a staff sling. Building these simple yet sophisticated machines introduces fundamentals of math and physics using levers, force, torsion, tension, and traction. The colorful history of siege warfare is explored through the stories of Alexander the Great and his battle of Tyre; Saladin, Richard the Lionheart, and the Third Crusade; pirate-turned-soldier Jon Crabbe and his ship-mounted catapults; and Edward I of England and his battle against the Scots at Stirling Castle. For the legions of Tolkien fans, budding backyard warriors, and engineering wizards, this book is a must-have.